Every season switch I like to look around and discover and predict the latest trends. Today I'm showing you some of my findings about the upcoming fall season. 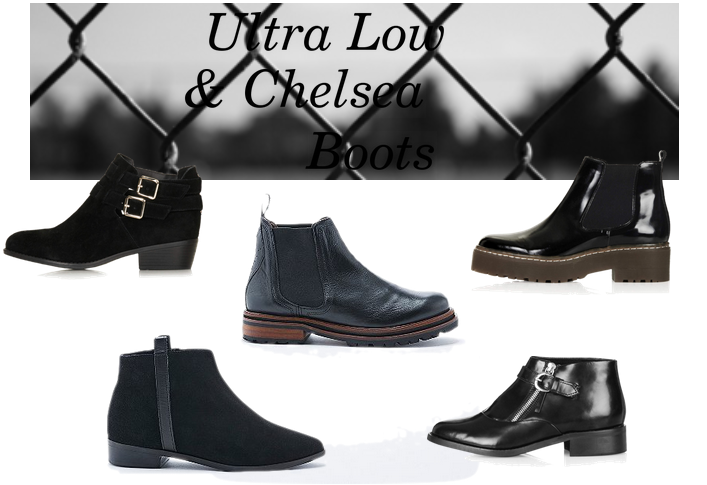 The first trend are ultra low & Chelsea boots. Especially black boots will be IT, but the brown shoes are also making a return in the fashion industry. Mostly it are the ends. Instead of middle-high boots fashionista's now would buy really really high boots or very very low boots. Click read more for my other trend predictions! I've seen the culotte pants in several stores by now and I totally fell in love with them. They are available in all kinds of patterns, from fake leather, to plain black to a granny styled color and fabric. In the picture above you can see how shops like Urban Outfitters, ASOS and Zara styled them on their models. 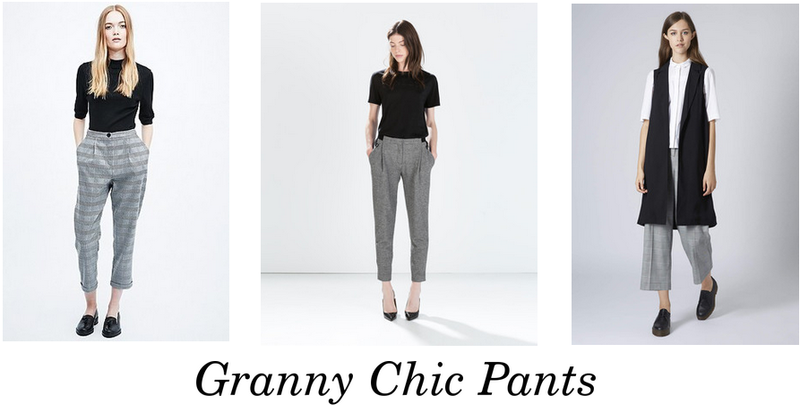 Of course we can not forget about the grey granny looking pants. I've already seen so many pants which were previously only stylish for work, but which have now grown to be a major fashion piece. I really like the striped one, but also the chic one from Zara and the wide fitted leg one from Topshop. One of the last trends, and I literally am so excited for this one, is yellow. I totally am in love with this color and I think it will look so good with a plain black outfit. Or even white mixed with a light yellow color will look cute. The pieces above are a cardigan and jumper from Urban Outfitters. One of the catwalk trends this season, and I think this is no big surprise to most of you, are fake fur, fringes and other outstanding (literally) materials. I really like such fabric since it creates a lot of deepness and a layered effect in your outfits. 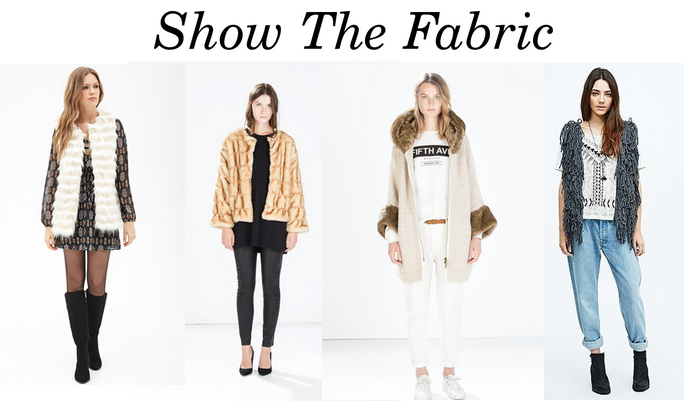 Check out this white vest, this fake fur cardigan, awesome jacket or fringed vest. Which trend do you like the most? Let me know in the comments! Ik vind ze allemaal wel erg leuk! 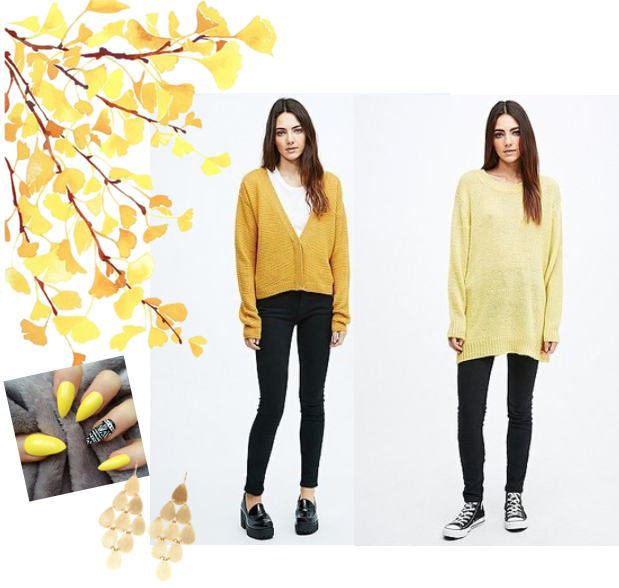 Hele leuke trends! Die culotte broeken zou ik persoonlijk zelf niet zo snel dragen - just a matter of personal style - maar ik vind ze wel erg leuk staan bij anderen. Super gave trends :) Coole schoenen :) !